I have had the Blue Jay return to my life after a year or so absence...could be it was there and I was unconscious. Recently, several feathers have been gifted and they have been swooping me to get my attention (slow learner). As I pulled the information out I realized that I am working on two planes that need this medicine. On one plane, I have been deeply engrossed with the work of A. H. Almaas. He has spent the last 25 years integrating psychological theory and spiritual teachings. Very few works pierce me as deeply as this man's work. The teaching of BlueJay is about right use of power and the level of dedication towards one's work. I see the Blue Jay encouraging me to go deeper and to stay with this line of study. On the other plane, Blue Jay is about right use of power against me (us). This was a surprise lesson as I had not realized that Blue Jay also warns us about danger from others, seen and unseen. As I examined my life, much of my corporate work has become very political and in some cases power plays are being enacted against me. Rather than allow myself to become victimized, the Blue Jay reminds us that it has vocal shape-shifting ability where it can mimic many other birds including red-shouldered hawks. Moreover, it is fierce in its defense of itself albeit directly or indirectly. The timing of this realization has been perfect as it enabled me to shift out of the line of fire. Instead of being drug down with some one else's power plays, I am choosing to sit in the bleachers and watch. In October, we have the Four-Chambered Heart workshop in Dodgeville, Wisconsin. It is working the wheel though the four chambers of the heart. We will allow TRUST to be our guiding theme in this wonderful journey in behalf of our selves. November 30-December 2, we will have an open Crystal Awareness workshop in Camp Asbury in Hiram, Ohio. Both workshops are beginning to fill, so I encourage you to reminder the early bird gets to be in circle. Large crested songbird with broad, rounded tail. Blue Jays are smaller than crows, larger than robins. 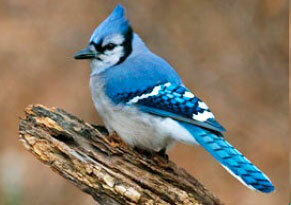 The blue jay has long been thought of as a bully and a robber. Although it can have those tendencies, it has other qualities that make it stand out positively. For those with a bluejay totem, it can reflect lessons in using your own power properly. It can also reflect lessons in not allowing yourself to be placed in a position in which it is misused against you. The word "jay" comes from Latin "gaia" or "gaea" which has associations to Mother Earth. In Greek mythology, the union of Mother Earth (Gaea) and Father Heaven (Uranus) resulted in the first creatures who had the appearance of life. This reflects much about the intrinsic power associated with the blue jay. It has the ability to link the heavens and the earth, to access each for greater power. The black and white markings found on its blue wings reflect this same ability. The sky (blue) separates the Heavens (white) and the earth (black). This is a totem that can move between both and tap the primal energies at either level. The jay is aware of this innate ability. This is reflected in its blue crest—higher knowledge that can be used. The primary problem with bluejay totem holder will be in dabbling in both worlds, rather than becoming a true master of both. Those with a blue jay totem usually have a tremendous amount of ability. However it can be scattered or it is often not developed any more than is necessary to get by. It is not unusual to find individuals with bluejay totems being dabblers, especially in the psychic and metaphysical field. They know a little bit about a lot of things, and they use that knowledge to give the impression they know more than they do or that they are true masters. The bright blue crest of the jay should always be a reminder that to wear the crown of true mastership requires dedication, responsibility, and committed development in all things in the physical and spiritual. The blue jay is a reminder to follow through on all things—-to not start something and then leave it dangling. 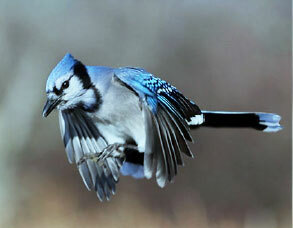 The bluejay reflects a time of greater resourcefulness and adaptability is about to unfold. You are going to have ample opportunities to develop and use your abilities. The jay does not usually migrate during the winter, so look for ample time to develop and use your energies to access new levels. It will stay around and work with you as long as you need it. The bluejay is a member of the crow family. Most crows have no fear. Bluejays will gang up and harass and drive out owls and hawks. The jay is fearless. It is because of this that it can help to connect with the deepest mysteries of the earth and the greatest of the heavens. The bluejay is an excellent mimic, with a sharp eye and voice. It has a wonderful knack for imitating red-shouldered hawks. Old time naturalists were convinced that the bluejay derived pleasure from this activity. As with all members of its family, this sense of pleasure seeking, often at the expense of others, can reflect an imbalance. Sometimes jays appear when this is occurring in your own life. Bluejays have a tremendous ability for survival with the least amount of effort. They reflect great talent, but that talent must be developed and utilized properly. If the jay has flown into your life, it indicates that you are moving into a time where you can begin to develop innate royalty that is within you, or simply be a pretender to the throne. It all depends on you. The jay has no qualms. It will teach you either direction.